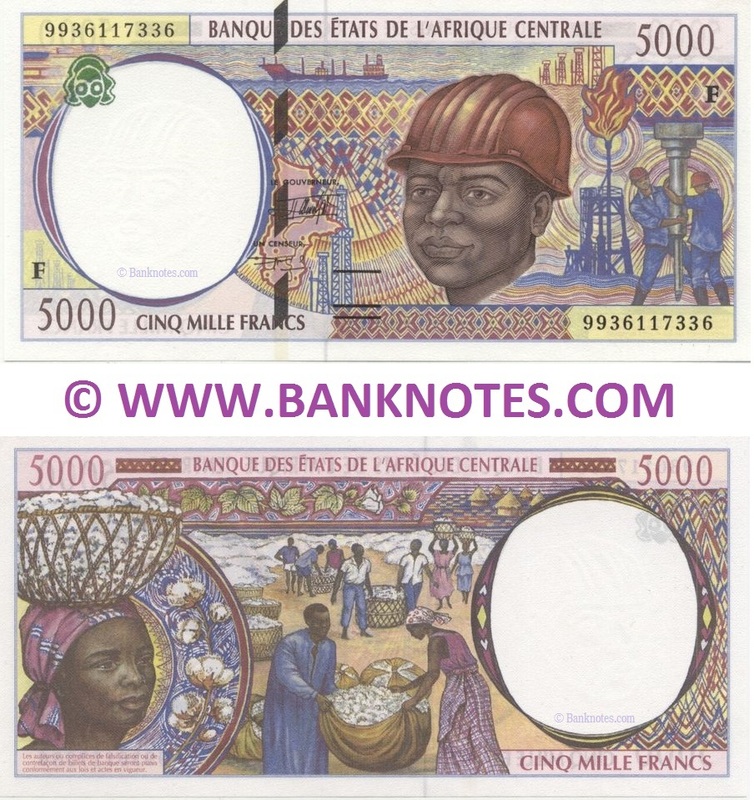 Central African Republic 5000 Francs 1994-99 - Central African Currency Bank Notes, Africa Paper Money, CAS Banknotes, Banknote, Bank-Notes, Coins & Currency. Currency Collector. Pictures of Money, Photos of Bank Notes, Currency Images, Currencies of the World. Front: Map of the Central African States. Oil rig workers in hardhats with drill. Flare stack. Oil tanker. Oil towers. Oil derricks. Back: African women and men carrying cotton in baskets and cloth bundles. Straw huts. Watermark: Head of an oil rig worker in hardhat. Security features: Watermark. Running serial numbers. BEAC globe logo fluorescing under ultraviolet light. Segmented 3 mm wide security thread. Predominant colour: Violet. Multicoloured. Artist: Pierrette Lambert. Engraver: Pierrette Lambert. Signatures: Jean-Félix Mamalepot (Le Gouverneur, July 1990 - April 2007); Ludovic Ognagna (Un Censeur). Security thread: Segmented, 3 mm wide. Printing method: Intaglio. Issuer: Bank of Central African States (BEAC). Date of First Issue: 1994. Date of withdrawal: 2002. N/a. Legal tender: No. Total issue: Information pending. Material: Cotton paper. Printer: François-Charles Oberthür (FCO) or Banque de France (BdF). de billets de banque seront punis conformement aux lois et actes en vigueur. République Centrafricaine. Franc Centrafrique. All texts, images, other materials and content on this entire website are the property of Banknotes.com and its owners.